Rather than drone on with numbers that have little relevance to most people, I like to use simple stories and pictures whenever possible. The following illustration shows two pies. The pie on the left is what the U.S. government spent in 2007 and the annual deficit, which was $161 billion. I remember that deficit seeming large at the time. The next pie shows what the U.S. government will spend in 2013 and the annual deficit, which will be around $900 billion (if everything goes perfect with economic growth and tax collections). 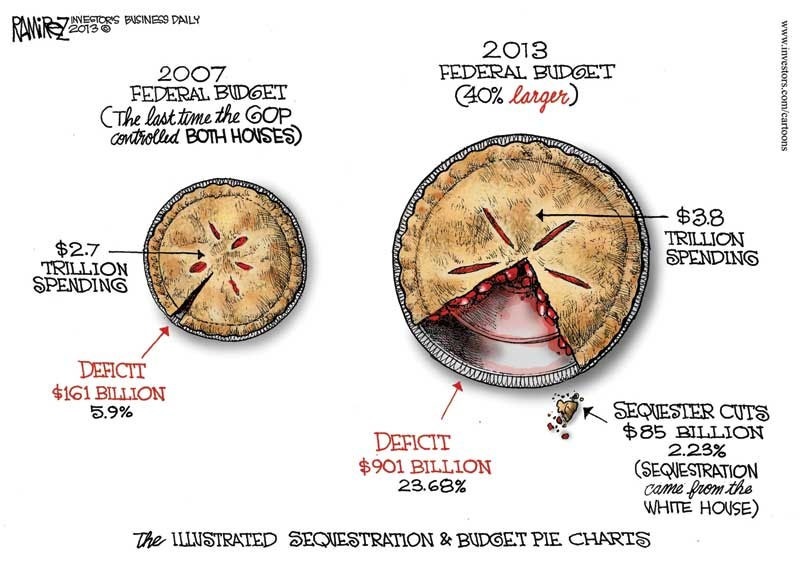 The small little pebble of pie below the dish represents the sequester cuts in comparison to the total size of annual spending. In many ways the removal of this little pebble is going to slow the economy significantly, which shows the sick dependence the U.S. currently has on deficit spending in order to keep the artificial economy moving forward.